Did George Eastman realize what he did for us with the invention and release of the Kodak? That cool little camera enabled many a family to retrieve pictures and ways of living that were not possible prior to photography. 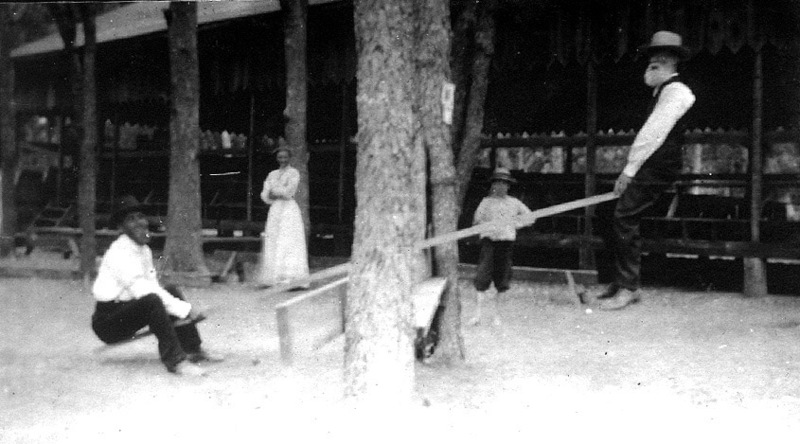 I am the custodian of family photos, snapshots, and post cards from the early 1900s to about 1960. 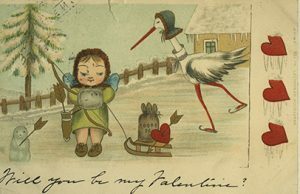 The images here are from my personal collection. 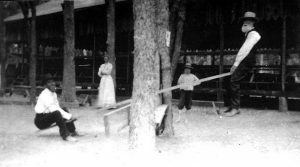 This is one of the early snapshots, about 1906, taken in Williamson County, Texas, and probably during a Swedish Methodist Bible Camp. I don’t know who is in the picture but I love it. It is all about hats! 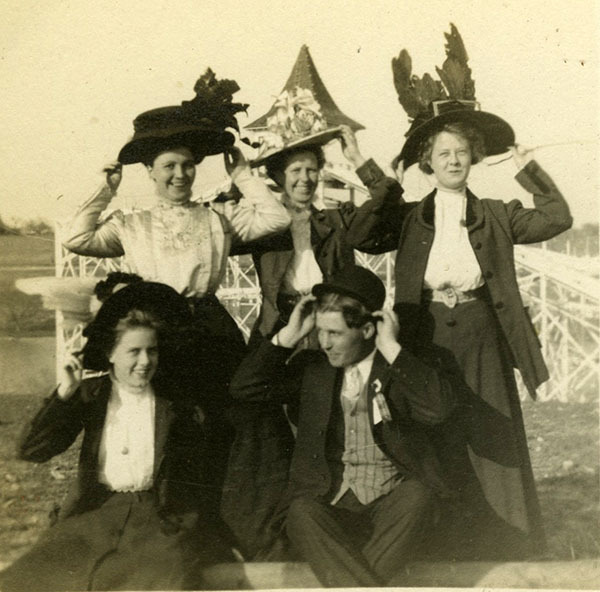 This is around 1908/1909 and, again, I cannot identify the people but that does not matter; the hats – including his – are a hit. 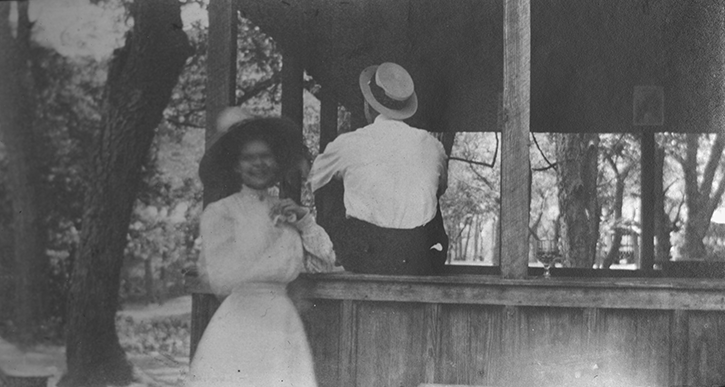 This is from grandma’s Engagement Party at Katy Lake, Texas, about 1908/1909. Frank has his back to us; Lydia has the ring. 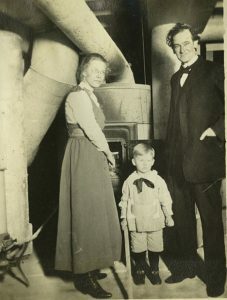 This is my aunt and her father-in-law showing off the new furnace in Buffalo in 1917. Where else would you find a fabulous furnace family photo? To the right is an earlier, but more traditional, snapshot of my aunt and her husband. This is the heading out of San Francisco Bay of the Great White Fleet 1907-1909 and was taken by a photographer, Ed Stein, on board one of the ships. 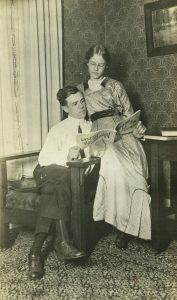 Almost with the rise of personal photography came the post cards. Again, it was George Eastman who was the innovator. 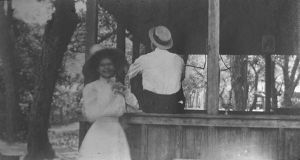 The first real photo post card dates from 1899, but with Eastman’s purchase of Velox Photo Paper with the pre-printed post card back, printed images became readily available by 1902 (http://www.metropostcard.com/metropchistory.html). This Valentine is from 1902 and the one below from 1906. The Golden Age of Post Cards was from about 1900 to 1917. The best printers were in Germany and World War I ended their dominance and innovation. 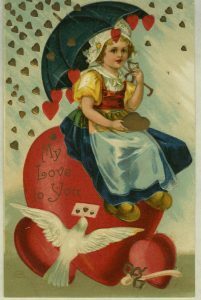 Until 1907, one side of the card was for the address and the other for imagery and message; the change of 1907 was to divide the address side so that address and message were together.